Abstract: Power and propulsion of ships need to reduce fuel consumption and increase versatility. This paper classifies ship propulsion topologies into mechanical, electrical and hybrid propulsion, and power supply topologies into combustion, electrochemical, stored and hybrid power supply. We review opportunities and challenges of hybrid architectures and advanced control strategies that can reduce fuel consumption and emissions up to 10 to 35 %, while improving noise, maintenance, manoeuvrability and comfort. Trends and opportunities for control strategy improvement are discussed. We conclude that a combination of torque, angle of attack, and Model Predictive Control with dynamic settings could improve performance of smart ships. Reference: R.D. Geertsma, R.R. Negenborn, K. Visser, J.J. Hopman. 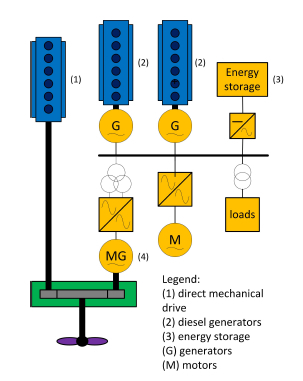 Design and control of hybrid power and propulsion systems for smart ships: A review of developments. Applied Energy, vol. 194, pp. 30-54, 2017. Open Access.